ICCS 2017 a success in Zurich! Over 400 computational scientists from around the world convened in ETH in Zurich, Switzerland (12-14 June) to exchange the newest developments in computational science techniques and its broad spectrum of application domains, ranging from cancer research to urban heat problems. 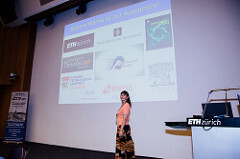 Keynote lectures ranges from discussions on the use of (deep) learning techniques as part of the computational science methodology, to modeling the entire Austrian economy to assess and reverse the systemic risk arising from risky loans and trades. Next year the conference will be held in Wuxi, China on June 11-13, 2018. Mark it in your calendar!